This is my absolutely favorite children’s bible. I hadn’t read any sort of children’s bible since I was a child myself and when I was looking for something different to use in Children’s Church, I knew The Jesus Storybook Bible would be the way to go. It was highly endorsed at seminary, and several friends of mine use it in Children’s Ministry at their church. 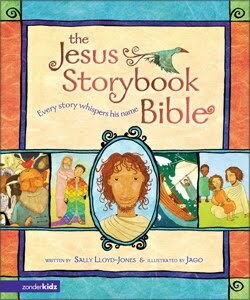 Sally Lloyd-Jones tells the story of God rescuing us over and over throughout this bible in a beautiful and thoughtful way. I’ve never liked kids. I’ve never wanted to have them, never wanted to work with them. I only do so now because it’s a small percentage of my job, and thankfully God has made me not hate them in the process. Today I talked to the kids in Children’s Church about how our sin separates us from God. We read the story of Jonah running away from God and how that’s just like when we sin – we get further and further away from him. These kids just love this book. They love the pictures, the way she writes (it truly is a story bible) and the crazy way I give characters funny voices. How did I get here? I have no idea. Thursday my plumber came to replace my garbage disposal. As he was working I was cutting up a paper towel core, putting slits on each end and putting them together to make an ichthus. Then painting it with glue and adding glitter. I’m single, 37, never wanting to have kids and this is my life. I work on kids’ stuff for church. I’ll admit, if I didn’t have to I wouldn’t be doing it. It’s most certainly not in my sweet spot. Give me an adult asking me my opinion on the Northern or Southern Galatia theory any day. But I have learned, in writing curriculum for children, how it reminds me that if I can’t explain it so children can understand it, they I don’t understand it myself. Watching those kids today gobble up The Jesus Storybook Bible and the story of Jonah gave me water for my soul. So did my cute new plumber who said to me, “man… you can make something out of everything if you try,” as he watched me get glitter on my face. This post is part of the he caused waters to flow project.